March was an amazing month for fungi. 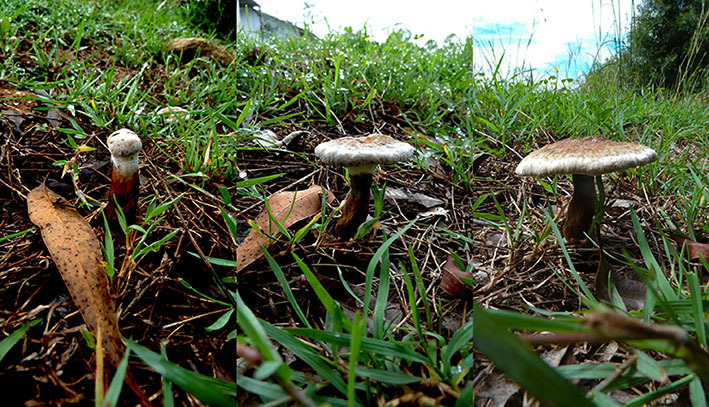 The much higher than usual rainfall combined with the unseasonal high temperatures seemed to be perfect for mushrooms. 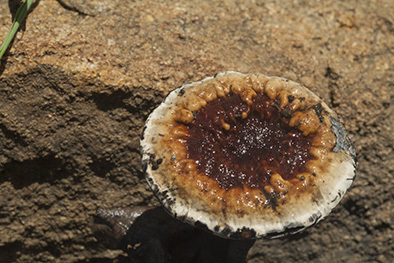 The Red-staining Polypore – not a particularly romantic name, but referring to the multiple pores on the underside of the cap that turn red when bruised (see photo below) – was one that was much more common than usual. Its scientific name is Amauroderma rude. Here’s what the top of the cap of a fairly fresh specimen looks like. 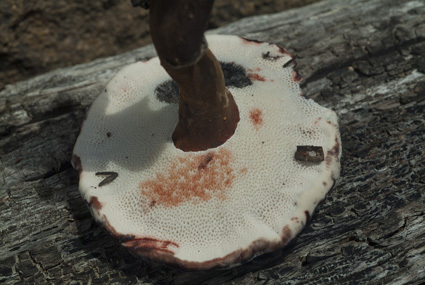 This species grows on a woody stem that starts out looking like an old brown stick standing vertically in the ground, then gets a bit of “white fungus” on the top end, before gradually morphing into a more or less classic mushroom shape. Here’s a time sequence – three shots, three days apart. Later the cap becomes a dark “tobacco” brown, going through a stage where it has a narrow white margin which is lost on many specimens. The mature cap, like the stem, is hard and woody. I’ll post some more shots of our autumn fungi as I find time to process the photos. This entry was posted in general, wildfire. Bookmark the permalink.